Basseterre, St. Kitts, October 10, 2017 (SKNIS): Despite the turbulent weather that disrupted the Independence Day Celebrations to mark St. Kitts and Nevis’ 34th Anniversary of nationhood on September 19, a number of visiting dignitaries graced the federation with their presence for the post activities on Saturday, October 07 and commended the Government for a splendid parade. The vising dignitaries included Their Excellencies Honourable Bruce Zagers, Commissioner of Saba; Phillippe Ardanaz, Ambassador of the Republic of France; Linda S. Taglialatela, Ambassador of the United States of America; Priyo Iswanto, Ambassador of Indonesia and their delegations; Mitsuhiko Okada, Ambassador of Japan and Mrs. Okada; John Pilbeam, High Commissioner of Australia; Vladimir Eisenbruk, Ambassador of Czech Republic and Mrs. Eisenbruk; and Jesus Sierra Victoria, Ambassador of Panama. Other foreign dignitaries included Agnes Pust, Charge d’ Affaires of the Canadian High Commission; Rachel Pringle, Representative of the New Zealand High Commission and Edward Munn, Representative of the British High Commission. 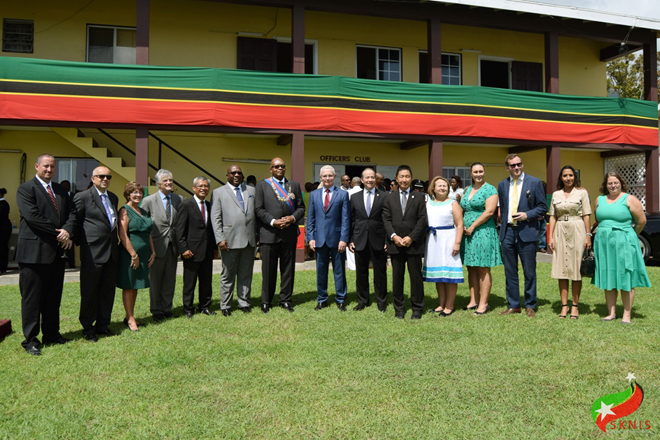 Prime Minister, Dr. the Honourable Timothy Harris, warmly welcomed the dignitaries and thanked them for celebrating with St. Kitts and Nevis. The Toast followed shortly after the Independence Day Parade held at Warner Park, which allowed citizens and residents to see members of the security forces and other organizations pay tribute to the nation. Immediately after the toast, Prime Minister Harris held four back-to-back bilateral meetings with the representatives from the Czech Republic, France, Japan and Panama. During their meeting, the French Ambassador complimented Prime Minister Harris for the splendour of the event, noting “it was a beautiful parade and everything was very nice, especially with the kids. I think we have to do the same thing in France to have kids included in everything,” he added.